Just thought I'd post up the stock and oversized oil filter part numbers that interchange with each other. BTW, I will give credit to Eric Zappe, and his book [ame="http://www.amazon.com/High-Performance-Cherokee-Builders-1984-2001-Design/dp/1932494146/ref=sr_1_1?ie=UTF8&s=books&qid=1253232993&sr=8-1"]High Performance Cherokee XJ Builder Guide[/ame]. Can't hurt to have a little extra oil in there! Last edited by firehawk; 03-30-2009 at 10:02 PM.
" the ONLY reason you're still conscious is I DON'T want to have to carry you!" Hey thanks. I read this one time a while back and had no idea where to find it. I think I'll get one of these, then change the oil. That is a alsome book! Great I always use the Mobil 1 M301 but it is sometimes hard to find so this gives me alternatives. Thanks buddy. So I would need to put in how much more than 6 quarts? Eric's book is great, and there are a lot of good ideas in there. I've been running oversized oil filters for a year now following Erics recommendation. It's something I would not have thought about before. Have a look at his website as well at www.ericsxj.com as he has done a lot of extra stuff since the book came out. Also this awesome thread, http://www.jeepforum.com/forum/showthread.php?t=540357 which has the bang upto date stuff!! He's got an fantastic XJ!! Last edited by UKJeepThang; 07-23-2009 at 03:58 AM. I agree 100%!! I like the direction his build has gone. He obviously has put a lot of time and money into it, but has had the sense to not go waaay overboard!! I really like the way he built his rig, and he is a really nice guy!! BTW, the book is REQUIRED material for any serious XJ fan!! Im in where can I find the book???? Im surprisingly comfortable with it. our local NAPA store runs a customer appreciation sale once a year. you can place a bulk order for oil filters. i usually get 2.00 off per filter(plus the sales tax savings>) we usually have no limit on how many you can order. Is anyone else out there have a deal like this in there area? 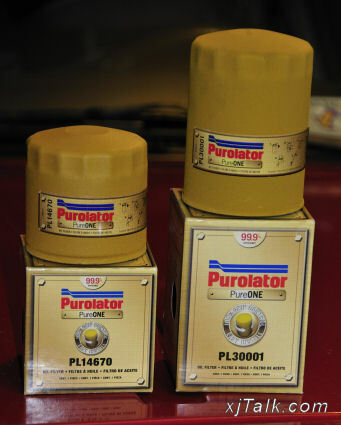 Updated original post with pictures of Purolator stock and over sized oil filters. now you have to know that on the older renix models you have to do some mods for this to work so it is not a bolt on for all years. just so you know.